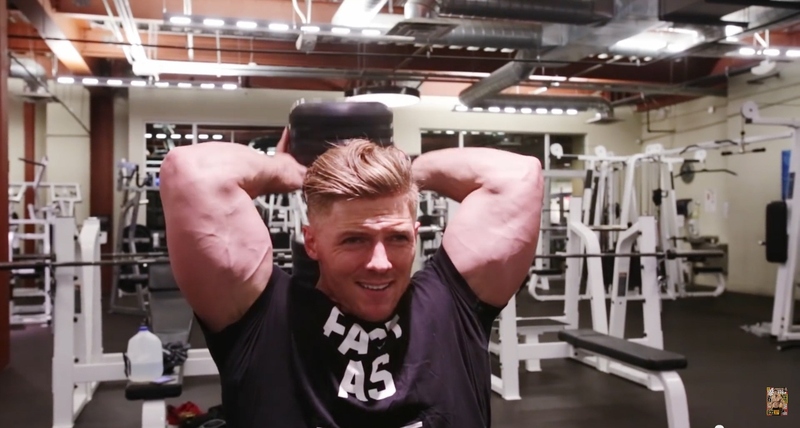 Whenever Steve Cook is training arms, his t-shirt sleeves have a hard time. They cannot cover his stunning 19 inch arms any longer which are popping out from them. It is his final set of preacher curls. Steve is performing it with the last of his strength, and is groaning with pain. He smiles and enjoys it anyway, knowing that these last repetitions lead to the desired muscle growth. Total dedication with a winning smile – this is typical for Steve’s workout. Steve Cook (born in 1984, height 6’1“, weight 215 lbs) radiates joy no matter whether he is lifting, posing or speaking about fitness. He loves sports and the gym. There he has built and sculpted his imposing physique which is characterized by considerable muscle mass, great definition, and harmonious proportions. He has established his reputation as an IFBB Physique Pro, a BodySpace 2011 Spokes Model Winner, an Optimum Nutrition sponsored athlete, and a fitness model, and has been on the cover of several big fitness magazines. Steve’s passion for fitness was aroused at a very early age. Being the son of a coach and athletic director, as well as the middle child in a family of seven children, all of whom excelled sports, he strove for excellence. Pushups were a must before being allowed to watch tv or hang out with friends. It was through daily pushups that his initial „mind-muscle“ connection was formed. Steve’s physical achievements were overshadowed by a private crisis. He and his wife of four years decided to divorce. At the time it was a devastating blow. „I was at my lowest point. That forced me to look at my life. I didn’t like who I was when I looked in the mirror“, he admits. Unsure of how to move forward, he turned back to the only thing that has never let him down – the gym. He focused on regaining balance in life, and continued to heal emotionally nurturing himself in the gym. „The only thing I had was my love for weights, and I decided to compete in a local bodybuilding show. The competition gave me something to look forward to and work at every day. It took my mind off the divorce by making me focus on the weight. It was the turning point of my life that I decided to take control of my life in the weight room and in the kitchen.“ Steve finally won the contest. „Going through a contest preparation and winning my first competition gave me confidence that I could handle anything. I went back to school and finished my Bachelor’s degree, and continued to compete as a bodybuilder and fitness model.“ Shortly afterwards he placed 1st in the ABFF Show/Boise Golds Gym Classic and earned his Pro Card. Now Steve wants to help other people achieve their fitness and health goals. There is one advice which is near and dear to him. "Don't compare yourself to other people", he says. "Whether it's in competition or just in the gym, there is always going to be someone out there with better calves or a better chest, but the minute you start comparing yourself physically to other people is the minute you're not going to be happy with your training. If you concentrate on your progress and getting better from month to month then you will be satisfied. The best advice I can offer is to focus on yourself, focus on your goals and achievements, and don't allow anybody else's progress scupper your fitness plans." More motivation can be found on his Facebook page. There he updates the visitors on his shape, announces his activities, as for instance photoshoots and journeys, and informs about new videos on his YouTube channel. His videos cover all aspects of his life in the fitness industry. He demonstrates how effective posing and how photoshoots work, prepares meals for fitness enthusiasts, comments on supplements, and reports from the big fitness expositions. Steve has a knack of talking to the viewer. His explanations are a mixture of profound knowledge, personal experience, and fun. This holds true for his training videos which are the jewels of his channel. Whether treadmill or bench press or preacher curls - the videos abound with Steve’s insider tips for the exercises. He explains them in detail and extends himself when performing them. The training videos are longer and more comprehensive than most other workout videos on the internet. The viewer gets the impression that he actually attends Steve’s workout. 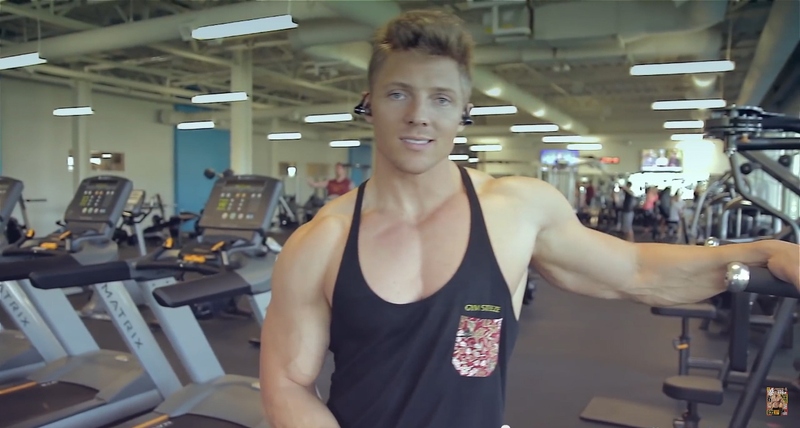 Steve Cook shows that working out can mean far more than building a ripped physique. He says: „I love working out because it prepares one for the challenges in life. Everyday I go to the gym and put myself through hell, I know that mentally I am to handle anything life throws at me. The hours of training and dieting have strengthened not only my body but my mind as well.“ Steve’s love for working out has changed his life by getting him through his toughest times. No wonder that more and more people follow his philosophy and get bitten by the bug. All images are screenshots from videos of https://www.youtube.com/user/swoldiernation and https://www.facebook.com/SteveCookFitness.